Pu-erh tea, a well-known traditional Chinese tea, has been categorized as sun-driedgreen tea, and its pressed products from large tea leaves 大叶种晒青毛茶为原料(Camellia sinensis O. kuntzevar. assamica Kitamura) are manufactured mainly in Yunnan, China. In the markets,three kinds of pu-erh teas have been sold: loose pu-erh tea, pressed pu-erh tea,and pu-erh tea bags.Pu-erh tea is a popular tea with a long history, which originated from the districtsof Xi-shuang-ban-na西双版纳州, Si-mao思茅, and Lan-chuang-jiang valley澜沧江, Yunnan Province云南省,China. Pu-erh tea is of interest to consumers because of its quality and health care function and is distinct from other kinds of tea. Because of its health care function,especially when aged, pu-erh tea is loved by many tea drinkers. The collection and drinking of pu-erh tea has become a fashion and a unique pu-erh tea culture. It is generally believed that the older the pu-erh tea, the better（under certain circumstances. The good quality of pu-erh tea comes from large tea leaves from Camellia sinensisO. kuntze var. assamica Kitamura大叶种. Some pu-erh teas are also made from other specieswith small leaves, such as Camellia sinenesis Linn小叶种. According to the shapes ofpu-erh tea, most products in the market can be classified into two categories: loosetea and pressed tea. The loose tea is the dried product of pu-erh tea in its originalcurled strip shape, while pressed tea is made by pressing the loose tea into a bowlshape沱茶, brick shape砖茶, or ring cake shape饼茶. All pu-erh tea products with different shapeshave to be broken into pieces before brewing with boiling water. According to the degree of fermentation, pu-erh tea products can be classifiedinto green tea-like pu-erh tea生茶, post-fermented pu-erh tea熟茶.The green tea-like pu-erh is processed without fermentation or storage under highhumidity. The products in this category consist of Yunnan green loose tea, greencake tea, raw cake tea, green tou-tea, and raw tou-tea. Fermented pu-erh tea is producedby microbial fermentation of piled fresh loose tea or green pressed tea, andthen stored at room temperature for an extended and appropriate period of time, and may be called Yunnan pu-erh loose tea, pu-erh tou-tea, or pu-erh ring cake tea. There are two manufacturing procedures that have been widely employed forproduction of pu-erh tea: the classical pressing method传统压制 and the wet-piling method湿堆. The former dates back to the Tan Dynasty (864–1278 a.c.), while the latter has beendeveloped recently (1938 a.c. to present). Step 1. Plucking of fresh tea leaves. The best fresh tea leaves are plucked in theearly spring (March). The tea leaves plucked in the middle of spring (April)and late spring (May) are still good for making pu-erh tea. Step 2. Blanching. The fresh tea leaves harvested in step 1 should be subjected toa blanching process as soon as possible by baking on a hot pan with constantmanual mixing. As soon as tea leaves become very soft and liberate a uniquegrass fragrance, the blanching process should be stopped at once. At this stage,presumably the enzyme reactions in the tea leaves are also terminated. Step 3. Rolling. The purpose of rolling is to liberate the juice of the tea leavesto the outside of the leaf surface. Thus, the flavor of the tea leaves willbe released easily when brewing with hot water. 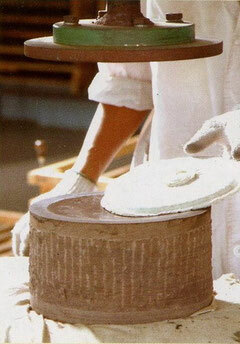 In the classical pressingmethod, the rolling process is done manually. Therefore, approximately 5kg of this tea product may be manufactured by a skillful tea maker on adaily basis. Step 4. Sun drying. The rolled tea leaves are dried under sunlight with constantmixing. The heat and infrared rays from sunlight penetrate the tea leavesand remove the moisture as well as promote chemical reactions in the leafmatrix. This process takes two working days to accomplish. The moisturecontent of the final products should reach 12–15%. The product obtained iscalled dried raw tea. Step 5. Storage in a dry place. The dried raw tea is packed in a large, clean gunnybag and stored in a temperature- and humidity-controlled stockroom. Step 6. Pressing into different shapes. (a) Pickings(Sorting or grading). 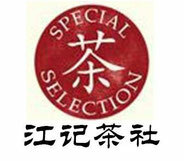 The dried raw teas are subjected to selection and classificationon the basis of quality and homogeneity. Some dried raw teas maybe contaminated with stems and foreign bodies, and these should beremoved. (b) Weighing. 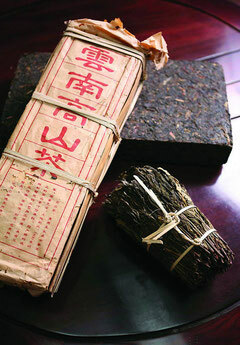 Generally, a cake of pu-erh tea weighs 357–400 g.
(c) Steaming. The steaming step is critical for making good-quality puerhtea. In most cases, the dried raw tea is packed in a cloth bag and abronze cylinder is used for steaming. The steaming time should be keptwithin 40–50 seconds. If the time is too long, the tea becomes too ripeand yellow coloration develops. The quality of water used for steamingis very important, and in most cases, mountain-stream water is used. (d) Pressing. The steamed soft tea in the cloth bag is pressed between twostone templates. A tea maker stands on top of the stone template andtwists his or her body to distribute the body weight while pressing onthe cloth bag in order to make the cake of pu-erh tea. Step 7. Long-term incubation for ripening. This step is essential for makinggood-quality pu-erh tea. 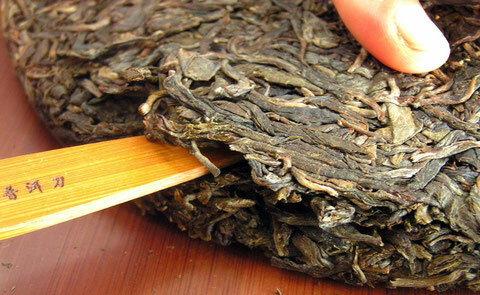 It is a general rule that the longer the storage, thebetter the quality of pu-erh tea. In the same batch of manufactured products,a 50-year-old pu-erh tea should be better than a 5-year-old one fordrinking and health care function; the prices of these products will differaccordingly. The incubation is carried out in a temperature- and moisturecontrolledroom. However, in ancient times, this incubation process wasdone on horseback during the transportation. Step 1. Plucking. As described in step 1 above. Step 2. Blanching. As described in step 2 above. Step 3. Rolling. As described in step 3 above. Step 4. Sun drying. As described in step 4 above. Step 5. Fermentation by wet piling. In the process of pu-erh tea manufacturing,both enzymatic and nonenzymatic oxidations play a very important role inthe transformation of tea components. These oxidation reactions take placevery slowly and persistently. Furthermore, oxidation is assisted by environmentalmicrobes and oxygen. The sources of microbes are poorly understoodand may come from inside (endogenous) and outside (exogenous) oftea leaves. The origin and proportion of both endogenous and exogenousmicrobes that are actually involved in the fermentation process remain tobe investigated.The water content of most sun-dried tea products is in the range of 9–12% and should be increased by showering with water to an appropriatemoisture of 20% or higher (as judged by the experience of the manufacturer).The tea mass is mixed thoroughly during the showering process.The water should be clean and free from harmful microbial contamination.High mountain streams are the water of choice and are generally used inthis process. The resultant wet tea mass is piled up as high as 1.0–1.5 m.Each pile contains approximately 10 tons of tea mass and is covered withwet gunnysack粗麻布袋 (or wet gunny cloth) to maintain its moisture and temperatureduring fermentation. The temperature of the pile may reach 50–60°Cand should not exceed 65°C. These piles are kept in a ventilated cleanroomfor fermentation. Step 6. Repiling and mixing翻堆. The temperature and moisture of the piles areessential for determining the degree of fermentation and are important factorsaffecting the quality of pu-erh tea. The temperature and moisture of theincubation room and tea piles are strictly controlled. The tea piles should bebroken down, mixed, and piled up again every 2 days. More water shouldbe showered during the repiling and mixing process. It takes five to eightrepetitions of repiling and mixing to accomplish the fermentation process.The finishing point should be determined by an expert by judging the colorof the fermented tea mass (should be reddish brown红褐) and taste of the teaextract with water. The tea extract should be “friendly” to the mouth, freefrom astringent taste, deep red brown in color, and persistent with old teaflavor. Once the piled tea mass fulfills these criteria, the fermentation processcan be stopped. Step 7. Air drying. The fermented piled tea products are broken down andseparated into several valleys for air drying (not sun drying). The watercontent of piled tea products is around 20%, but is reduced to 14–20% uponair drying. The tea mass is then broken down and separated into severalnew valleys again every 3–5 days. The air-drying process is repeated againand again until the moisture of the tea product reaches 14%. Step 8. Selection and grouping. The air-dried tea products are subjected to strictselection and grouping based on their color, size, fragrance, and appearance. Step 9. Packaging and pressing. The selected air-dried tea products are packedin a gunnysack and stored in a dried stock room. 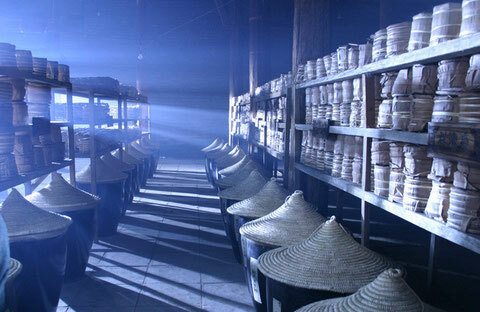 The air-dried tea productscould also be pressed into different shapes, such as cubic, brick, bowl, andring cake, and then stored in a stock room.